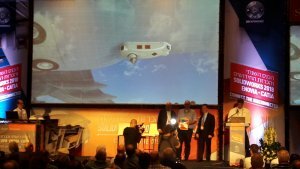 [Herzliya, October 31, 2017]: BIRD Aerosystems, the leading developer of Special Mission Aircraft Solutions (ASIO) and Airborne Missile Protection Systems (AMPS), has won the first place in Systematics’ Solidworks projects competition that took place yesterday, as part of the Systematics’ annual conference in Tel-Aviv. The competition included 17 different projects. Designed using Systematics’ SOLIDWORKS software, the Aeroshield Pod is an all-in-one POD solution which provides the most comprehensive anti-missile aircraft protection for narrow and wide body aircraft and VIP jets. Easily installed, BIRD’s AEROSHIELD POD provides optimum platform protection with minimal interference to the aircraft, while fully complying with EASA/FAA civil aviation regulation procedures. Using the AMPS-MV advanced configuration which ensures a Zero False Alarm rate, the AEROSHIELD POD is ideal for wide-body aircrafts such as the A320, B737, B777, A380 etc., and can be easily transferred between different aircrafts. The AeroShield POD was presented as part of the Static display at the Systematic conference, and later on was chosen by the 1,500 participants at the conference to be the winning project among the 17 different projects that took part in the competition. This is the first time the AeroShield POD is presented in Israel. Ronen Factor, Co-Chief Executive Officer and Founder: “We are honored that BIRD’s AeroShield Pod solution has won the first place in Systematics’ Solidworks projects competition. Our experience and knowledge of the customers’ needs allow us to develop high-end products, which are already being used by many different customers worldwide, including NATO members, the United Nations (UN) Air Operations, and the US and Canadian governments. BIRD Aerosystems’ will keep standing at the forefront of technology, and provide innovative products for aircraft protection and mission management”.